Designed for storing and working with intensive multimedia files including video, photos, audio, and music libraries, the 4TB G-DRIVE G1 USB 3.0 Hard Drive from G-Technology lets you store up to 4TB of your data and transfer it to or from your computer using USB 3.0 technology. Housed in an aluminum enclosure, the G-DRIVE G1 features data transfer rates up to 165 MB/s and a rotational speed of 7200 rpm, both of which allow for quick file access and fast data transfer speeds. 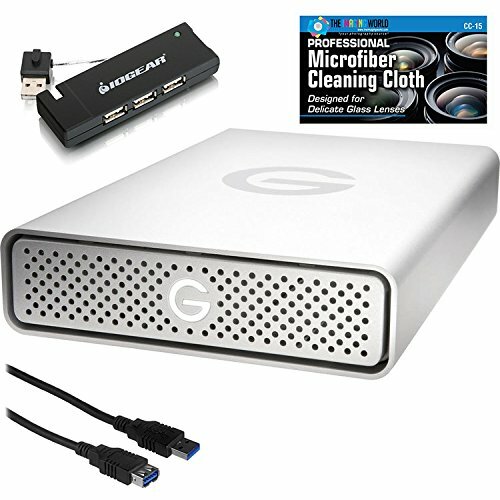 The G-DRIVE G1 natively supports USB 3.0 and includes a USB 3.0 cable, and is backwards compatible with USB 2.0. -- While the G-DRIVE G1 is compatible with both Windows and Mac, it comes formatted for Mac OS and supports Apple's Time Machine software, allowing your Mac to be backed up to this drive. To use this drive with Windows, it will need to be reformatted. Also included with the G-DRIVE G1 is a power adapter. If you have any questions about this product by The Imaging World, contact us by completing and submitting the form below. If you are looking for a specif part number, please include it with your message.